Fortress Of Freedom Board :: View topic - Tabitha Blair Signs Music Contract With FOF! Tabitha Blair Signs Music Contract With FOF! Posted: Wed Sep 14, 2011 5:30 am Post subject: Tabitha Blair Signs Music Contract With FOF! 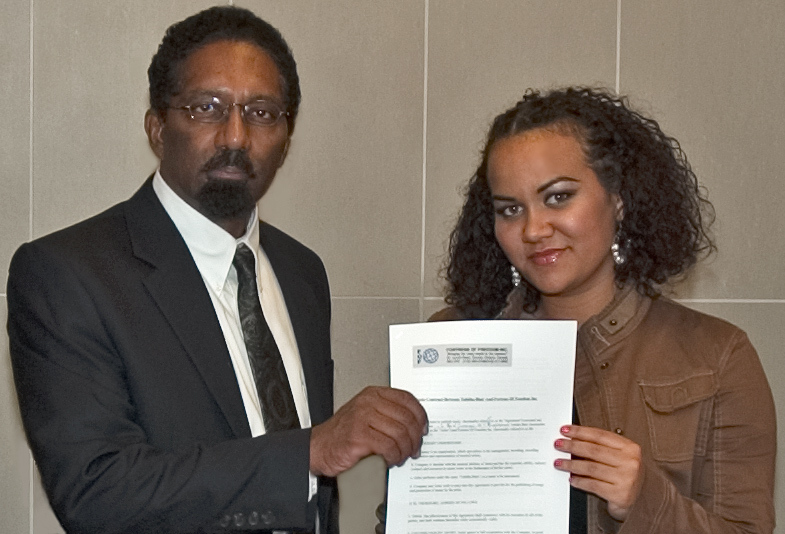 FOF President Maurice Ali holds contract with Tabitha Blair! The Fortress Of Freedom and FOF RECORDS Corporations are excited to announce that singer-songwriter Tabitha Blair has signed a music contract with FOF! The Toronto based performer was first noticed by us when she performed several of her songs at this years FOFSTOCK held on August 1, 2011 at Toronto's Yonge-Dundas Square. So from all of us at this organization, we wish Tabitha Blair all the best with her association at Fortress Of Freedom Inc. and FOF RECORDS Inc.!